Nothing ruins a good game more than a flaky controller. You press the jump button and Mario keeps running and you are dead. You know the controller is bad, but why? The answer lies deep inside the controller. 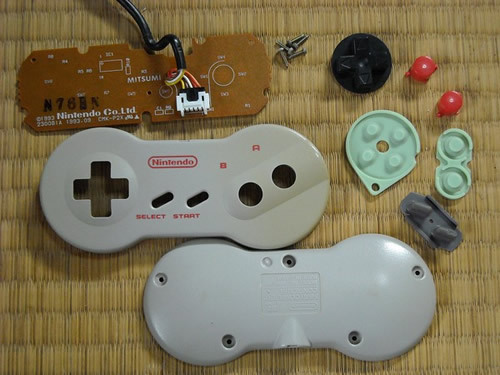 If you remove the four small screws holding the two halves of the controller together you’ll find the rectangular pcb, the plastic buttons and the mushy button culprit: four small rubber membranes. These small rubber pieces give each button its spring–that positive feedback you get after you push the button down. Typically the A button rubber piece is the first to go. That’s the most used button in the Family Computer, AV Famicom and Super Famicom consoles. That’s the button you press a million times a second trying to get your man to run faster in a game like Hyper Olympic. So how do I tell if my Famicom controller is bad? Start with the A button rubber piece. Look for small cracks or tears between the center section and outer ring. If your A button is mushy and doesn’t have good feedback, you’ll probably see small cracks. Rubber pieces with cracks just can’t offer the same spring. Sometimes you’ll find the center part of the rubber piece is nearly torn completely from the outer ring. How do I fix my old Famicom controller? The only way to fix it is to replace the rubber parts. And since the Famicom is closing in on 30 years since it went into production, finding NOS (new old stock) rubber pieces is nearly impossible. Your best bet is to salvage parts from a good, working #2 controller that hasn’t been abused. It’s usually the #1 controller A button that goes first. I’ve seen fc #1 controllers that looked like they’d been used as a hockey puck, with both A and B buttons only partially functioning, yet the #2 controller still had the thin plastic protector film covering the top side, and buttons with excellent, like-new response. Scavenging spare #2 controllers is an option. Usually the pcb and wiring on the FC controllers continue to work, trouble free. It’s rare to have a controller with good rubber that doesn’t work as it should. Though I have seen bad, flaky pcbs on occassion. 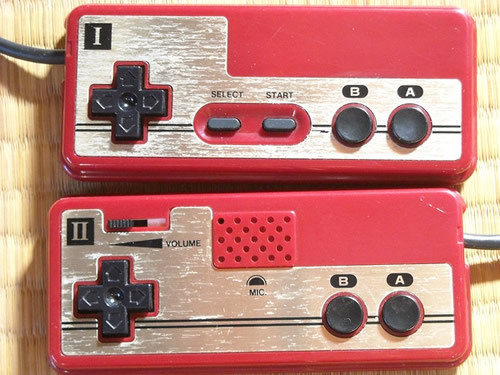 What about the AV Famicom and Super Famicom controllers? The same principals apply to the AV and SFC. If you’ve got a flaky controller with poor response, carefully take it apart, clean out the dust, and check the rubber membranes. The AV uses the “dog bone” shaped controller. Since the AV and the SFC are not quite as old as the FC, their rubber parts might be in better shape–a 1983 part vs. a 1993 part. Ultimately, the quality of a controller boils down to how many times each button was pressed, and was the console put back in its box after use, out of sunlight? If you can’t actually feel the controller, if you are buying online, then give the A button a close look. If the seller doesn’t provide high quality close up images, don’t buy it. Look for wear marks around the A button. If you see definite wear marks, then don’t buy the controller. The cleaner the better. Even if you do buy a clean looking controller, the rubber parts inside may be worn out. But you stand a much better chance with a clean, less used controller. Also, you can simply ask the seller if the buttons have good response and feel. If the seller says, I don’t know, or No, then stay away. I hope this helps you in your quest for quality controllers. Dave at http://retrogamerjapan.com sells Nintendo Famicom consoles, games and more.